STANDISH — Last year, Jeremiah Sands lost his shoe during the Western Maine Conference cross country championship meet. This year, he took extra precautions with his laces. “I triple-knotted them,” said the Falmouth senior. Sands ran away from a 16-school field Friday afternoon over the challenging 5-kilometer course through the campus of St. Joseph’s College, winning the boys’ race in 16 minutes, 37 seconds. 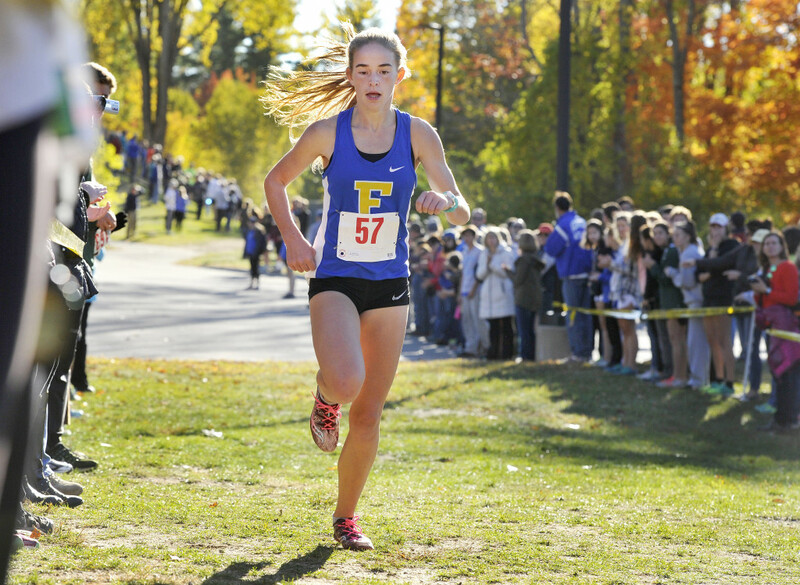 Fellow Falmouth runner Malaika Pasch, a sophomore, won the girls’ race in 19:11 after nearly taking a wrong turn in the first mile. “I turned right when I was supposed to go straight,” Pasch said. “The girls behind me quickly told me to turn around. 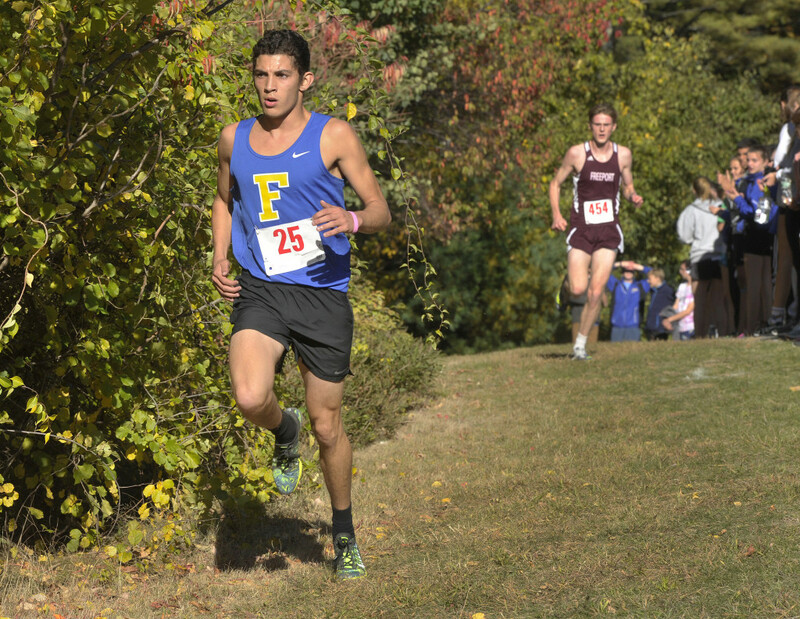 In team competition, Falmouth and Wells won the boys’ large and small school divisions, respectively. York and St. Dominic did likewise for the girls. 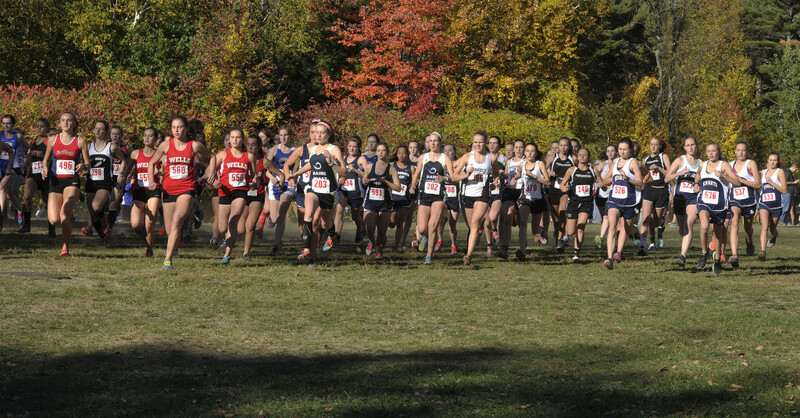 York Coach Candace Jaffe expected a tough battle with Greely and Yarmouth, the only teams to beat the Wildcats during the regular season, but both of those coaches opted to rest their top runners for the upcoming regional and state meets the next two Saturdays. Falmouth Coach Danny Paul has a similar philosophy. Had the meet been scored as one instead of broken into two divisions, Falmouth’s boys would have won by 25 points over Wells, with Freeport third and Maine Coast Waldorf fourth. “We like to win the conference,” Paul said. “To me, the only reason we’re a little cautious sometimes is that the course is very hard and we’re trying to save legs for the state meet. We go to Twin Brook next week and that’s a hard course, too. Falmouth’s John Auer and Conner Piers placed fifth and sixth. 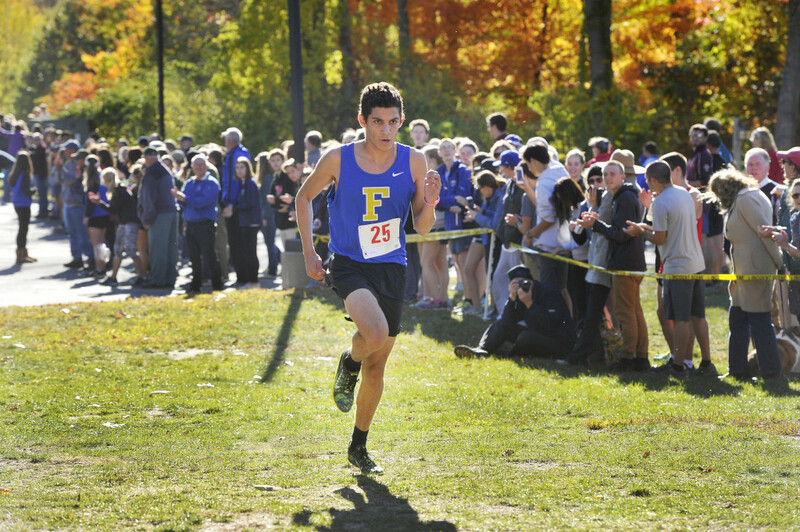 Senior Ben Wyman, normally the team’s second runner, placed 17th and was Falmouth’s No. 4 runner after losing his left shoe for the second year in a row, in nearly the same spot in the woods. “I still had two and a half miles to go,” said Wyman, who got the flat tire despite wrapping tape around his laces. Tucker Pierce of Maine Coast led early before dropping back to third. Freeport senior Henry Jaques finished second, seven seconds behind Sands and 24 ahead of Pierce. On a crisp and cloudless day, Jaques made sure he admired the brightly colored foliage. Kennebunk senior Louise Holway, who spent her previous autumns carrying a field hockey stick, finished 23 seconds behind Pasch and 14 ahead of York junior Kathryn Miller. It was Holway and Miller who corrected Pasch on her course. Had the girls’ race not been broken into two divisions, York would have won by 15 over Cape Elizabeth, with Falmouth third, another four points back. In addition to Miller, York’s Grace Reynolds (fifth) and Malia Cryan (ninth) finished among the top 10.